I wrote this review last weekend and scheduled it to post for today. In the meantime, I learned of Montgomery's suicide AND I began reading her Selected Journals. My opinion of The Alpine Path has already been reshaped but I felt like posting my original thoughts on it all the same. I'll post my revised thoughts at the end of this review. You'll recall when I read Maud: The Life of Lucy Maud Montgomery that I wasn't very impressed with author Harry Bruce's portrayal of Montgomery. I thought it felt forced and contrived and painted Montgomery out to be god-like. (It was nauseating, really.) Well, I'm glad to report that there are different biographical works about Montgomery out there and I'm in process of finding them to read. They won't be here in time for the L.M. Montgomery Reading Challenge but I'll get to them all the same. Alpine Path was written by Montgomery as a six part story detailing her career for the magazine Everywoman's World. In this series of articles (placed into chapters for book publishing purposes) she describes her life from childhood through her honeymoon travels. She writes this history of her career much like she writes her books -- full of adjectives and dreamery. (Hey, she makes up words. Why can't I?) You know what I'm talking about if you've ever read Montgomery. She's very flowery in her approach to language and this is something I really don't mind at all if it's in relation to a fictional tale that is supposed to transport you to some place magical. I confess I do mind it when it comes to writing a biography or an autobiography. 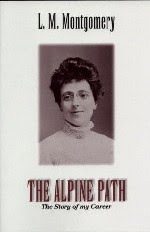 The title of this book/articles and focal poem for Montgomery when it came to discussing her writing career is the poem entitled The Alpine Path. After explaining the history of this poem in relation to her career Montgomery goes on to explain her family history dating back to Scotland. It's hard to try to understand why as I don't think her great-great grandfather really had anything to do with her writing career. These articles feel more like an attempt, on her part, to satisfy public curiosity about herself. I have a feeling that she really didn't know how to write an autobiography and ended up writing "what she knew" in the end, giving unimportant details and unrelated facts. However, people wanted to know about her so I suppose this book does serve a purpose. As I mentioned, she concludes this original series by sharing entries from her journal that talked about her travels on her honeymoon tour in Scotland and London. I found these journal excerpts not very entertaining or on point with the expressed intent of the writing. It was a distracting end. Montgomery does weave a lot of adjectives into the description of her journey to success. Maybe it's just me but I do have a hard time camping out on adjectives. Maybe it's that I'm very black and white by nature and Montgomery wasn't. What draws me to her fictional writing is the very thing that repels me from her non-fiction writing (about herself!). It's too much and feels over the top. I was also completely irked by the fact that Harry Bruce seemed to have copied and pasted quite a bit for Maud: The Life of Lucy Maud Montgomery. Whole paragraphs were lifted out and I already felt like I had read Alpine Path before I even really got started! I'll keep hunting and I'll keep reading but I predict I'm going to reach a point where I declare I'm not going to read anything else about Lucy Maud Montgomery the woman - I'm just going to better spend my time by reveling in her dream world. And here's where I officially take that last paragraph back! Having learned of her suicide and having begun to read her journals, I feel more compelled, not less, to read more about the woman. I find it very difficult to enjoy someone's works while disliking their person. There aren't very many degrees of separation in my mind, I do confess. I know now that I feel dreadfully sorry for the woman writer. I also feel like I can now honestly enjoy her work, accepting the darker, harsher aspect of who the writer is. Does that make sense? I also understand why she would use so many positive adjectives to describe herself and situation. Since I do believe she lived in a time where it was impolite to "air one's dirty laundry" (as it has been said) then it would make sense that she would never let down her guard in public - and never in writing. This becomes clear to me. I now feel more inclined to recommend The Alpine Path in conjunction with her journals. We are all complex people. Montgomery was no exception. I was only halfway through Anne (first and only LMM book I've read) when I read about her suicide here, and it DID color the way I read it. I think that Anne's high highs and low lows made more sense. Often times people who struggle with depression are manic -- so they are really high when they are high, and their lows are even lower than someone who is just an even-keel depressed person.